36 a-e-mag.com • A&E MAY 2019 Think back to what first drew you to the awards and engraving/custom gift game. Did it represent an outlet for creativity and design that accompanies the unique pas- sion for "recognition art"? Maybe it was the sense of accomplishment that envelops you when you see the delight in your customer's eyes upon receiving their order — while simultaneously carving out a nice chunk of income for you and your family. Even in the most frantic of times in a thriving awards shop, a business owner focuses his or her energies on improving customer satisfaction, maintaining product quality, and trying to run a smooth opera- tion. Only when the machines are powered down, the employees have clocked out, and the showroom sign is flipped from OPEN to CLOSED can management begin to assess if any headway toward achieving business goals was made that day. Unfortunately, any planning in most businesses is typically limited — by clock and calendar — to managing employees, prospecting for new customers, reviewing upcoming job orders, ordering raw mate- rials and supplies to fill those orders, responding to phone messages and emails from clients and vendors, and signing checks. 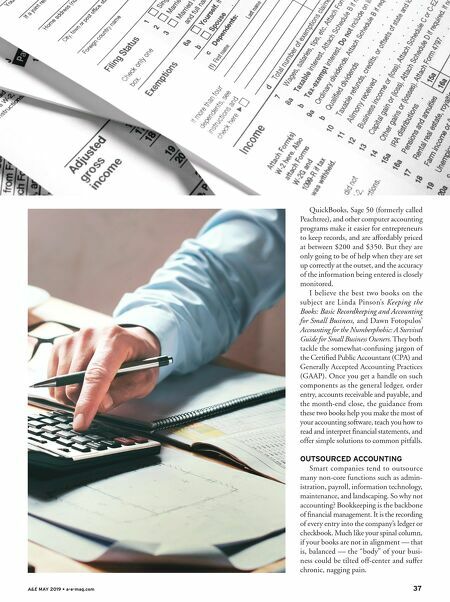 In most cases, a business's weakest skills turn out to be those of bookkeeping and accounting. So, rather than trying (and failing) to do it all yourself, why not fess up and seek professional help keeping your company's books? Let's explore some options. LEARN THE BASICS Bookkeeping and accounting are critical skills in helping owners track the flow of money that keeps their enterprises afloat — especially for start-up ventures where the founder may know everything about his customers' desires and how to produce a quality custom gift or award but little about financial matters. At the very least, therefore, invest in some training for yourself. Many local col- leges have a small-business development center (SBDC: www.americassbdc.org) that may offer courses along the lines of "Under- standing Finances for the Non-Financial Manager." Most of the time, these seminars are conducted at night or on the weekend for nominal fees. Vince DiCecco is a business training and development consultant and owner of the Acworth, Ga.-based business, Your Personal Business Trainer, Inc. He has been sculpting his sales, marketing and training techniques since 1979, and he has shared innovative and practical ideas in his seminars on business management excellence at past NBM Shows. He is avail- able to small- to mid-sized companies striving for sustained growth and market dominance. Contact him via email at vince@ypbt.com or visit his company website, www.ypbt.com. 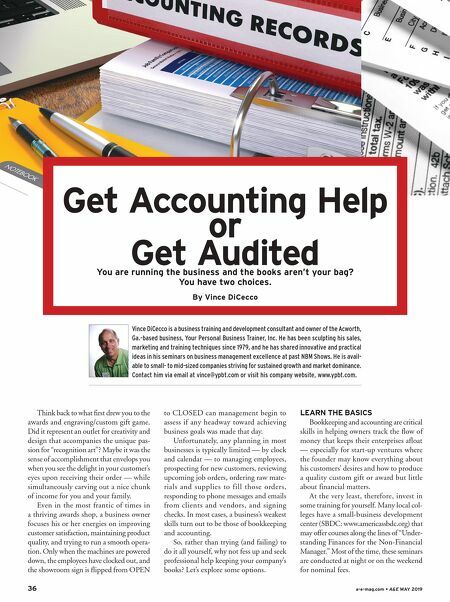 By Vince DiCecco Get Accounting Help or Get Audited You are running the business and the books aren't your bag? You have two choices.